Good afternoon mamis! This is a quick little post to let you all know what foods to eat to increase (galactagogue…big word on a Monday YIKES) or in some cases jump start your milk supply. My supply is still really good (10 months strong…YAYYYY) but I have noticed a little dip in supply (which is normal because meatball is eating some solids during the day). I’m not concerned enough to start taking fenugreek supplements again but I’d like to keep the milk coming so I did some research and have compiled a list of foods that help support milk production. The no brainer here is….WATER. You must drink, drink, drink, drink WATER to make milk…and even if you aren’t breastfeeding..this is just fact…we need to be well hydrated to function at our best level…but yeah…WATER is crucial when you’re making that liquid gold! The list isn’t that crazy and all of these items are very easy to find and incorporate into a daily diet. I like to use spinach instead of lettuce in my salads, and add raw nuts as an ingredient. Ginger is a great addition to any juice (I’m a big fan of juicing). One of my favorite juices is made of Kale (dark leafy green), green apples, celery, lemons and ginger…it’s tasty and combines 2 galactagogues…BOOM…winning! 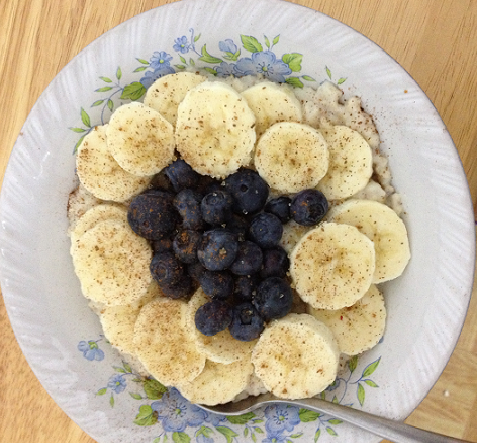 I’m not a huge fan of beets or yams, but I eat them because I know it’s good for me all around (how adult of me) but in short, even eating oatmeal for breakfast can help…and who doesn’t like a nice cup of cinammon brown sugar oatmeal with blueberries and bananas (recipe below)? I think you’ll find that these foods aren’t that hard to eat (toasted garlic bread anyone??? ), are nutritionally sound and will benefit you in more ways than just making milk…so get to eating mamis! In a pot, bring the almond milk, cinnamon sticks, cloves and anise (if you choose to add), sugar to a simmer. Then add the oats and stir constantly to avoid clumps. Once the oatmeal reaches desired consistency, plate it and while it cools down, slice the banana. Add the banana slices and blueberries as a topping and if you wish, you can sprinkle some ground cinnamon, brown sugar or drizzle honey or agave syrup, eat and enjoy! This is a hearty breakfast, full of fiber and keeps you nice and full through out the morning! I hope you all enjoy some galactagogue foods this week mamis! Made by me…easy and yummy! Are you Silky, Crunchy or Scrunchy? Silky Mami: Modern mother who prefers medicated hospital birth, bottle feeding/part time breastfeeding, disposable diapers, crib sleeping, etc. One who follows the advice of established medical authority; often tend to be working moms who rely on modern products for convenience and time management. Example: She buys her baby food, uses Pampers and vaccinates on schedule…She’s a silky mama! Crunchy Mami: Mother who supports homebirth, breastfeeding, baby wearing, cloth diapering, co-sleeping, gentle discipline, etc. One who questions established medical authority; tends to be vegetarian and/or prepare all-organic foods. Example: That crunchy mama is breastfeeding in public again! Scrunchy Mami: A mom that is a mixture of both a silky and crunchy mom. One who may formula feed, and vaccinate as well as hospital birth but may use cloth diapers and make their own baby food. Example: I formula feed my baby and choose to vaccinate but I support home birth and make my own baby food so I’m a scrunchy mom! I’ve determined that I’m a scrunchy mom that leans more towards crunchy. I definitely don’t do cloth diapering, and while I hesitate the validity of immunizations on a daily basis, I succumbed and followed the pediatrician’s advice to vaccinate meatball on schedule. What’s really funny is that Crunchy moms are defined as vegetarian or vegan and I’ve been considering moving over to a vegan lifestyle after I am done breastfeeding meatball (which could not be for another 2 years but extended breastfeeding is another post). I’m such a freaking hippie. What am I doing in this era? Anyhoot, how do you classify yourselves?